Shore morphology is a classic case study that has been researched by VIMS and Corps. The site has a long fetch to east of over 20 miles. The project covers 1,200 ft of shoreline with a spur installed as the first phase in 1978. 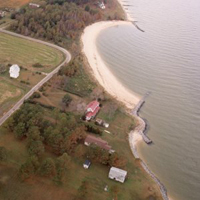 In 1992, a revetment was built on the downdrift side of the bay and the spur rebuilt; in 1997, large spur breakwaters were constructed off the revetment to set the tangential beach and perch the sand into the bay. The project has long-term management implications by enhancing existing shore features to create headlands and pocket beaches. The bay has recently evolved into static equilibrium over a period of 20 years.